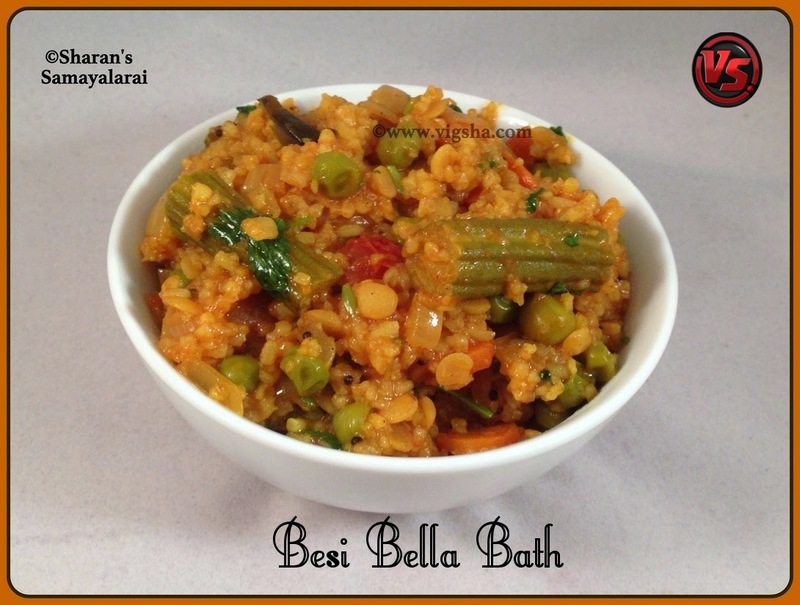 Besi bella bath is a very tasty and appetizing one pot meal with dal, rice and mixed vegetables. Also It is a nutritious meal and any vegetable can go into it. 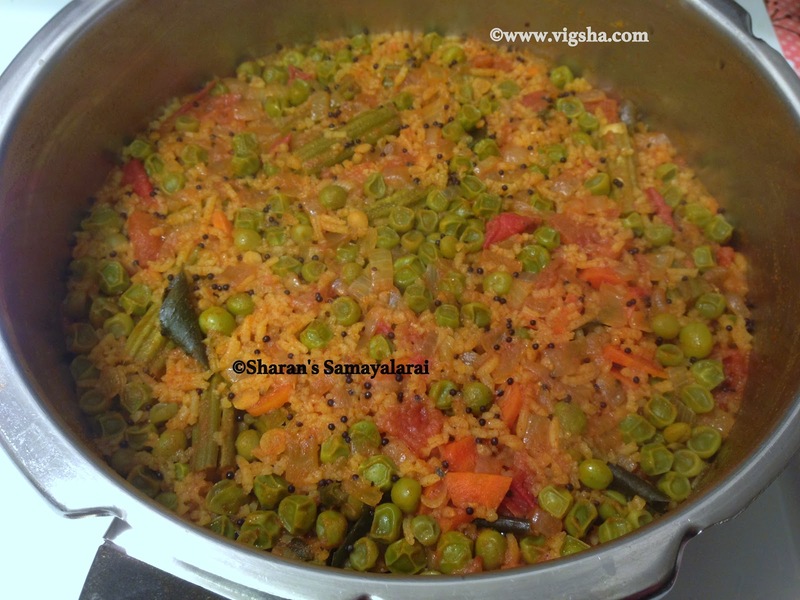 This is an authentic recipe from Karnataka. 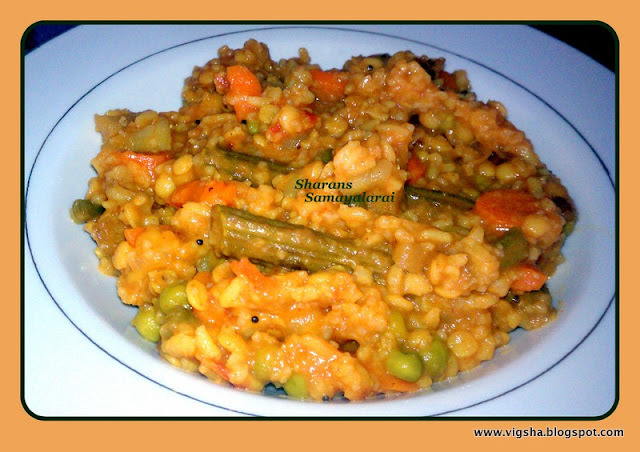 Bisi Bele Bhath in Kannada means hot dal and rice. There are a lot of recipes out there for Besi Bella Bath and the original version requires coconut, freshly ground and powdered spices. But this is my personal recipe with simple process. 1). 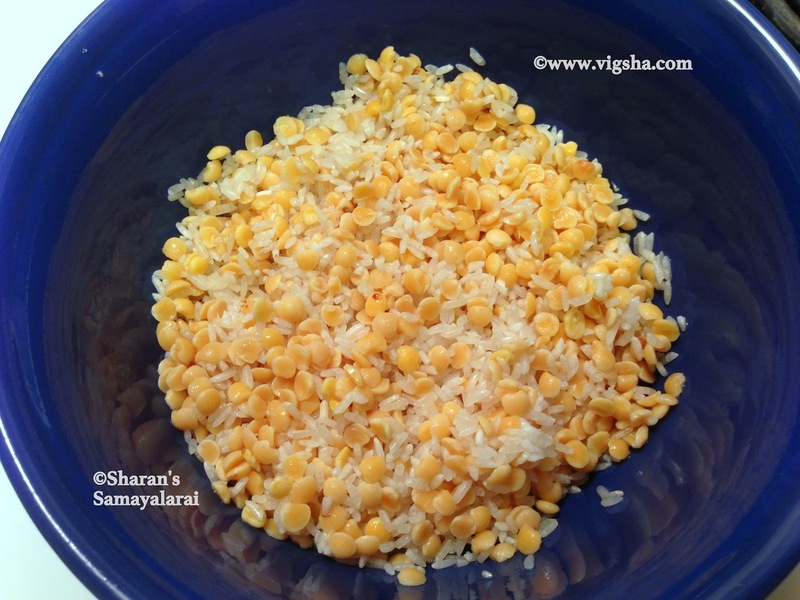 Wash and soak rice and dhal together for 30 min, keep it aside. Chop the veggies, extract juice from the tamarind (or) dissolve the paste in 1cup water without any lumps. Keep aside. 2). Heat ghee/butter in a pressure cooker, add the mustard along with curry leaves and let it splutter. Then add chopped onions, hing and salt, saute till onions turn translucent. Add tomatoes and saute till it becomes soft. 3). 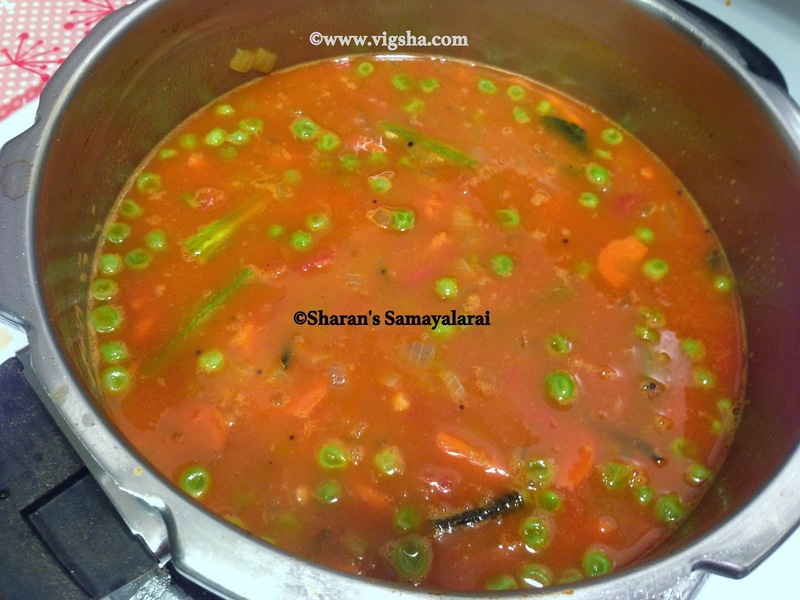 Then add the veggies along with turmeric powder, sambar powder, Chilli powder and salt. Mix well until all the veggies are coated with masala. Then add the tamarind extract and combine well. 4). 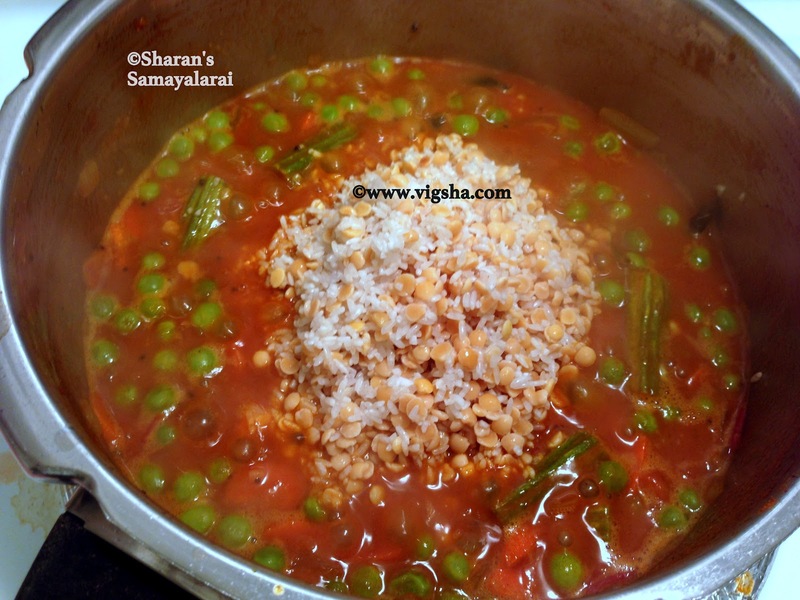 When it begins to boil, add the rice and dal to the above mixture and give a quick stir. Add 2½ cups of water and mix well. Check for salt and close the pressure cooker. 5). After 2 whistles and pressure releases, add the chopped coriander leaves and combine everything together. This wholesome rice dish from South India can be eaten all by itself. It tastes great with a dollop of ghee and papads or raita or tangy pickle. Serve hot !! # If you are using Capsicums - Heat a tsp of ghee and saute the capsicum till slightly cooked and use it for garnishing along with coriander leaves. # You can very well use freshly ground powders, as it brings out the intense flavors of all the spices used. # You can use any kind of rice ( Jasmine or Sona Masoori or regular kind ) but not basmati. # Add veggies of your choice. More the veggies, the healthier the dish will be. # I personally prefer pearl onions for this recipe. But you can also use spring onions. # I prefer Besi bella bath to be mushy so I add extra ½cup water and leave it for 2whistles. So adjust accordingly.